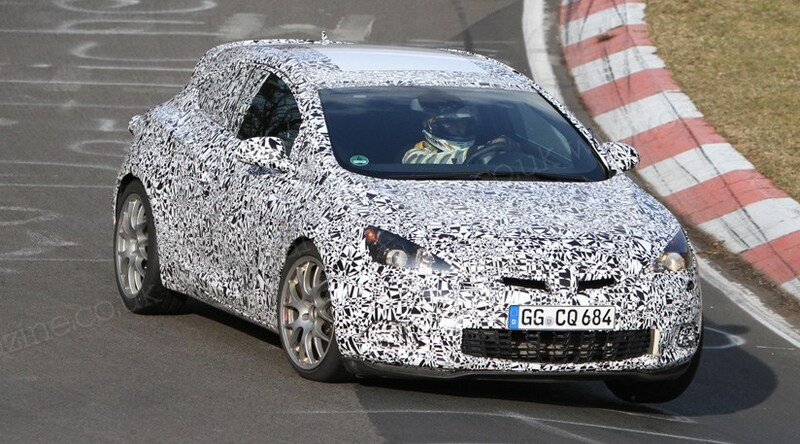 This is Vauxhall’s new hot hatch, the near-300bhp Astra VXR that our spies have just snapped testing at the Nurburgring. It is. VXR Astras have always boasted more power than the equivalent Focus ST, and with the new fast Ford only offering up 247bhp this hot Vauxhall will comfortably surpass that. The Astra VXR uses a turbocharged and direct injection 2.0-litre four cylinder engine, and will produce around 290bhp, while Vauxhall’s trick HiPerStrut front suspension, FlexRide adaptive damping system, and an electronic differential will do their best to control all the power going to the front wheels. Beyond that there’s a six-speed manual gearbox, fully uprated suspension, a big brake kit, chunky bucket seats, a VXR bodykit, and VXR interior trimmings. What’s the Vauxhall Astra VXR based on? Vauxhall’s new three-door Astra, which was previewed by the Paris GTC concept unveiled last year at, err, the Paris motor show. The new three-door Astra should retain the GTC tag, and will appear this summer with a motor show debut at the 2011 Frankfurt motor show. The Vauxhall Astra VXR will be revealed in spring 2012.